The first widely deployed Imperial starfighter to boast shields and a hyperdrive, the Alpha-class Star Wing had limited maneuverability, but was heavily armed for its size. The fighter remains impressively durable and destructive in X-Wing, where its two agility, four hull, and three shields are paired with the ability to unleash cascading torrents of missile and cannon fire. 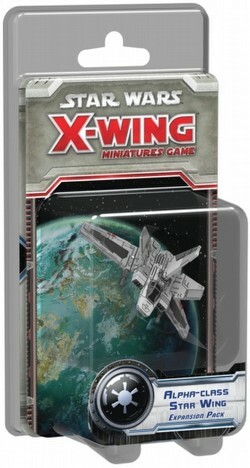 The Star Wing's pre-painted miniature is accompanied by four ship cards, seven upgrades, one maneuver dial, reference cards for the reload action and jam tokens, and all the plastic and tokens you need to fly the ship to battle.